Today marks the 110th anniversary of the birth of Leonid Brezhnev, the Soviet leader who did much to build up his country’s nuclear arms and its control over the Warsaw Pact countries. He was a rather vain man, who had himself awarded many medals in later life. His diaries also reveal the extent of his vanity, for they are full of detail about his hair, weight, clothes etc. But they also show, according to one modern writer ‘a total lack of intellectual and spiritual interests’ - ‘to every historian’s despair’. Brezhnev was born on 19 December 1906 in Kamianske, Ukraine, to a metalworker and his wife. He studied at the metallurgical institute in Dniprodzerzhynsk (now Kamianske). In 1928, he married Viktoria Petrovna, and they had two children. After graduating in 1935, he worked as an engineer and director of a technical school, but also he began to hold positions in the local branch of the Communist party. Having survived Stalin’s various purges, in 1939, he was appointed Party Secretary in Dnipropetrovsk, and put in charge of the city’s defence industries. 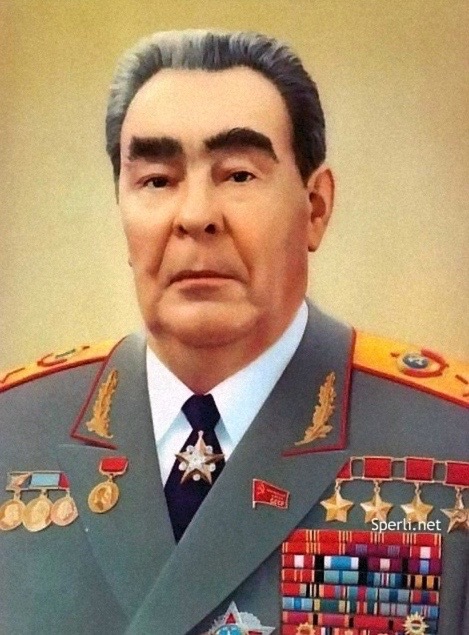 During the Second World War, Brezhnev served as a political commissar in the Red Army, progressing steadily to become a major general in 1943, and head of the political commissars on the Ukrainian front. On leaving the army in 1946, he returned to high level party positions, gaining national prominence in 1950 when elected as first secretary of the Central Committee of the Moldavian Soviet Socialist Republic. Two years later he was in Moscow, serving under Stalin in the powerful Secretariat of the Central Committee of the Communist Party. With Stalin’s death in 1953, and Nikita Khrushchev’s rise to First Secretary of the Central Committee, Brezhnev was sidelined, and posted to lower positions, first in the ministry of defence and then in the Central Committee of the Kazakh Republic. However, his administrative skills won him a recall to Moscow and membership of the Politburo. In 1960, he was promoted to the post of Chairman of the Presidium of the Supreme Soviet, nominally head of state. In 1964, he resigned that post to become Kruschev’s assistant as Second Secretary. By this time, however, having been loyal to Khrushchev, Brezhnev had begun to side with those criticising his leadership, and may even have led to plot to remove him. Brezhnev took over as First Secretary (subsequently General Secretary) of the Communist Party later that same year. Brezhnev’s early years as head of the Soviet Union were characterised by collective leadership: he left many affairs of state to colleagues, Aleksey Kosygin and Nikolay Podgorny, while he took charge of measures to control dissidence, through the Soviet Union, and travelled extensively aiming for more solidarity among the Union’s republics and its partners in East Europe. However, when Czechoslovakia tried to liberalise its Communist system in 1968, Brezhnev developed what became known as the Brezhnev Doctrine, justifying the invasion of Czechoslovakia by its Warsaw Pact partners. His leadership, in fact, would later be characterised by a massive build-up of nuclear arms, at a great cost to the country’s economy. During the 1970s, Brezhnev sought to ease tensions with the West, especially the United States, while, at the same time, consolidating his own power base at home, diminishing the effect of collective leadership. He negotiated various weapons agreements with the US, culminating with SALT II in 1979 - although the US chose not to ratify it because of the Soviet invasion of Afghanistan. In his latter years, Brezhnev’s vanity led to a growing personality cult (he was obsessed with being awarded medals); and there was a marked deterioration in his health. By early 1982, he was rarely appearing in public, and was no more than a figurehead with decisions being made in the Politburo without his presence. He died in November that year. Further information is available form Wikipedia, Encyclopedia of World Biography, Encyclopædia Britannica, Spartacus, or Country Studies (Library of Congress).